Sophomore forward Neila Luma makes a pass during a game against Princeton last month. Women’s basketball traveled to Williamsburg, Va., searching for its first road win of the season – and the team’s first victory in December. But GW (2-10) came away empty-handed Saturday, falling to William and Mary (7-4) 73–59 in the Colonials’ final nonconference road game of the season. The Colonials are now 0-for-6 away from the Smith Center and on a five-game losing streak. The Tribe burned the Colonials from distance, converting on 12-of-25 attempts from three. William and Mary’s ball movement, which led to 17 assists on 27 made field goals, broke down GW’s 2-3 zone defense and led to wide-open perimeter shots. The Colonials ended the night shooting 38.9 percent from the field while allowing the Tribe to shoot at a 45.0 percent clip. Despite the loss, GW won the battle under the glass 36-33. Redshirt sophomore guard Olivia Gumbs led the charge for GW. Gumbs, who played 12 minutes off the bench, had 13 points, two rebounds, one block and two steals to her name, all while sporting a brace on her left leg. Senior forward Kelsi Mahoney and senior guard Mei-Lyn Bautista both scored 11 points to round out the Colonials in double figures. 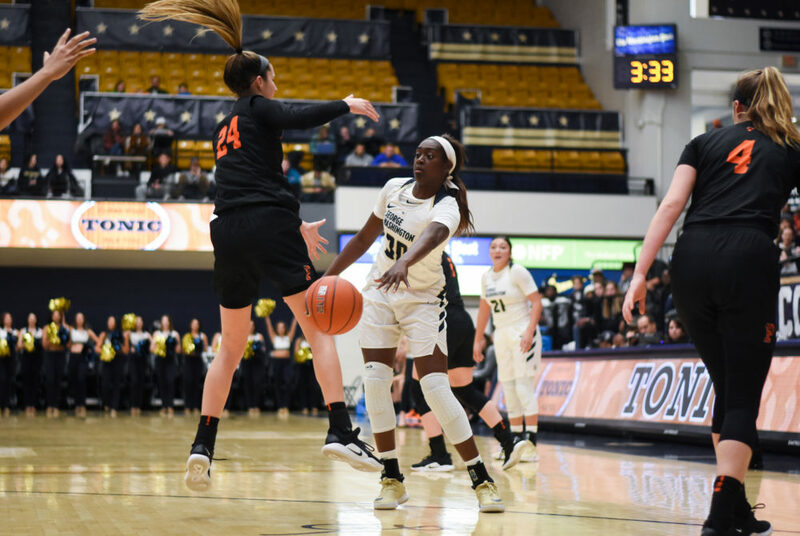 GW struggled to contain Tribe senior guard Bianca Boggs, who racked up 26 points, 10 rebounds, three assists, three blocks and two steals on 10-of-16 shooting from the field, including 3-for-5 shooting from distance. Boggs averaged 15.1 points per game heading into the contest. William and Mary redshirt sophomore guard Harper Birdsong, a GW transfer, chipped in with 16 points of her own, while freshman guard Eva Hodgson collected 11 points. Junior forward Victoria Reynolds, the Tribe’s second leading scorer heading into the match, came off the bench and had eight first-half points before exiting in the third quarter due to a lower body injury. One bright spot for the Colonials in the game was their bench. GW’s role players combined for 32 points, continuing a trend over the last three games in which nearly 50 percent of GW’s points have come from the bench. Following a home loss to Mercer, Rizzotti said the Colonials needed to do a better job starting games. GW did so defensively Saturday, holding the Tribe to 12 first quarter points. But the Colonials looked rusty on offense, committing six early turnovers and going 3-for-13 from the field in the opening frame, with many of the misses coming in the paint. The score was 12–9 in favor of William and Mary heading into the second quarter. “It can be a little frustrating and energy draining when we’re getting good shots and not capitalizing, but it’s something we have to work through,” Rizzotti said. After both two teams combined to shoot just 25.0 percent from the field in the first frame, the Tribe opened the second quarter with a 12-2 run. GW was able to get to the charity stripe more often than William and Mary, but missed free throws plagued the Colonials. Boggs had 12 points and six rebounds in the second quarter alone, helping the Tribe assemble a double-digit lead. They led by as many as 18 points 32–14 before the duo of Bautista and freshman guard Maddie Loder combined for 10 points in the final three minutes of play to cut into William and Mary’s lead 34–24 heading into the break. But William and Mary blew the second half open with a 28-point third quarter explosion, led by 19 combined points from Hodgson and Birdsong. A 9–2 William and Mary run to open the frame put GW back 43–26 with 7:19 left in the quarter. The Colonials saw their 10-point deficit balloon to as many as 20 points, and they trailed 62–42 entering the fourth quarter, despite converting 8-of-13 field goals in the period. The Tribe continued their push in the fourth quarter, racking up a 24-point lead over GW 66-42 with 8:27 left in the game. A three-point shot from Mahoney cut William and Mary’s lead to 14 points 67-53, but the Tribe hit the 70-point mark off a triple by freshman forward Emma Krause in the next play to put the game on ice 70–53 with 4:08 remaining. The Colonials will be back in action at home Tuesday for their nonconference finale, when they host the Memphis. Tipoff is set for 2 p.m.